Building structures with granite has become a forgotten art. Explore the forgotten corners of New England and you will discover a wealth of beautiful arches, granite houses and all sorts of factory components. Explore old cemeteries and you will find elaborate enclosures, granite spheres, obelisks and other objects commentating family plots. There is beauty associated with stone structures plus a feeling of strength and permanence in knowing that these structures will last forever. Over the years Natural Path Landscaping has developed a reputation for taking innovative approaches to many landscaping projects that we tackle. One winter, we designed free-standing granite arches to offer a special feature for your garden or walkway. These arches are designed to stand the old way, using only gravity and friction, but can be pinned if desired. We would like nothing better than to design and build something special and different for you. Perhaps you would like a garden gate or a fence built with granite posts to eliminate the problem of rotting wooden posts. 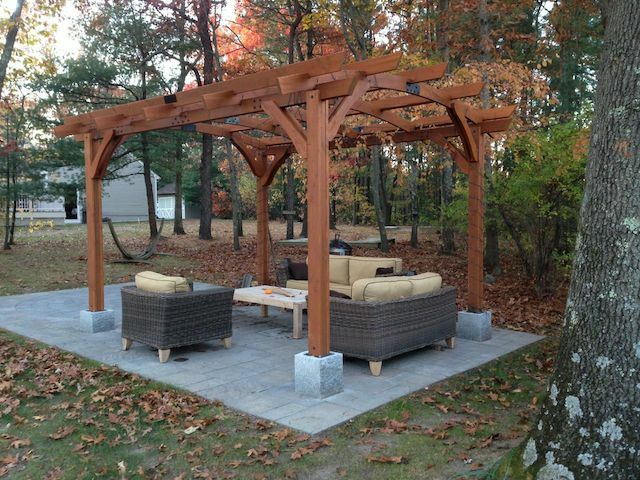 Arbors, trellises and shade structures for your patio are all possible projects. 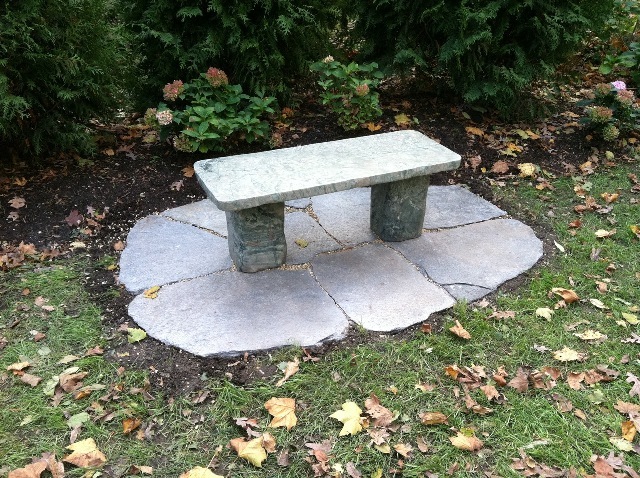 We work directly with a quarry in Vermont that can produce custom granite pieces from our AutoCAD drawings. We have access to extra heavy-duty hinges and can attach either wood or metal to stone for even more design flexibility. The possibilities are endless. This pergola is especially nice when lit in the evening. It is supported by 12"x12" granite posts extending 4' below the surface instead of concrete sonotubes. Granite sitting wall with apex post. Granite surrounds this bulkhead to blend it with surroundings. Granite posts support 6' high cedar privacy fence with 4' wide gate. Granite arches embed 4’ into ground. Rough pricing for granite, $3400 for the straight segment arch & $5300 for the curved segment arch, plus $2600 for installation. Cedar posts attached to granite post base to form a swag for a rose. 10"x10" granite blocks with firebrick form a unique fire pit. Curving granite steps and segmental retaining walls replaced a steel bulkhead. Permeable paving at the bottom absorb the rainwater. steps with overhanging granite landing. 12"x12"x9' granite columns provide a timeless porch foundation that is dependable, safe, and beautiful. A granite lamppost with full colored bluestone and granite steps in the background. This 12"x12" granite hitching post with an apex top protects the property against stray cars. The granite lamp post, granite mail box post and the curved granite steps with the unique handrails all come together to greet those who enter.